Serge Koussevitzky (1874-1951) presided for a quarter of a century at the helm of the Boston Symphony. He established the Berkshire Music Festival. Not content with founding a publishing company dedicated to the new music of the day, he created a foundation through which he commissioned — and which continues to commission — a long and distinguished list of works, including gems of the concert repertoire. He conducted the premieres of many of them himself, along with premiering a host of other works. He mentored many of the leading lights of the next generation of Americans, including Aaron Copland and Leonard Bernstein.1 Any one of these achievements would be enough to win him a permanent place of pride within the annals of music history. And yet, for a certain minority population — that of double bassists — he is even more esteemed as the greatest double bassist of his generation. His mastery of the instrument was phenomenal: he took up the instrument at age 14, joined the Bolshoi at age 20, and became principal at age 27. As a soloist, he gave his formal debut in 1898 and formally launched his solo career in 1901, the same year that he assumed the principal post in the Bolshoi. Two years later, in 1903, he gave his foreign debut in Berlin. In another two years, in 1905, he married Natalie Ushkov, daughter of a tea merchant, thereby becoming extremely wealthy. He resigned from the Bolshoi later that year to devote more attention to his solo career, playing recitals and concerti throughout Europe. In 1906 he additionally began studying conducting, moving to Berlin.2 Meanwhile he toured major musical capitals of Europe — Amsterdam, Berlin, Brussels, Budapest, Dresden, Hamburg, Kiev, Leipzig, London, Moscow, Munich, Paris, St. Petersburg, Prague, Stockholm, Vienna, Warsaw — often performing two different programs in a city.3 Unfortunately, despite the large quantity of materials in the Boston Public Library (hereafter, BPL) and the Koussevitzky Archive, Music Division, Library of Congress, including what survives of Koussevitzky's performance material, many scores are missing and few physical copies of his programs have survived, probably due to the conditions under which he left Russia. Consequently, contemporary journals are a major source of information, especially the weekly publication, Music Courier, which was published in New York City from 1880 to 1962. Here we find news nuggets, reviews of individual events, and compilations of excerpts from reviews, from important music centers of Europe. 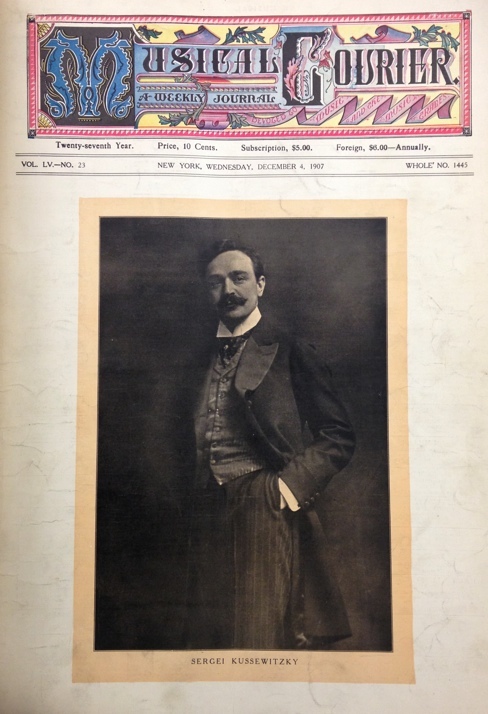 Koussevitzky appeared in items small and large, including being featured twice as cover artist, a very rare achievement (Figures 1 and 2).4 Details are included as an appendix.5 Other periodicals of the period also contribute to a lesser extent. For Russian press I have relied heavily on the Russian-language publications of Astrov and Yuzefovich. Koussevitzky's two career tracks of established instrumental soloist and budding conductor briefly coexisted: for example, his premiere as conductor, which was with the Berlin Philharmonic, was on Jan. 23, 1908, and his premiere as soloist with Arthur Nikisch and the Gewandhaus Orchestra was the next week on Jan. 29 and 30, 1908. In addition to performing with piano, he also performed with viola d'amore specialist Henri Casadesus, sometimes as a duo, sometimes as a member of la Société des Instruments Anciens, co-founded by Casadesus and Camille Saint-Saëns in 1901. 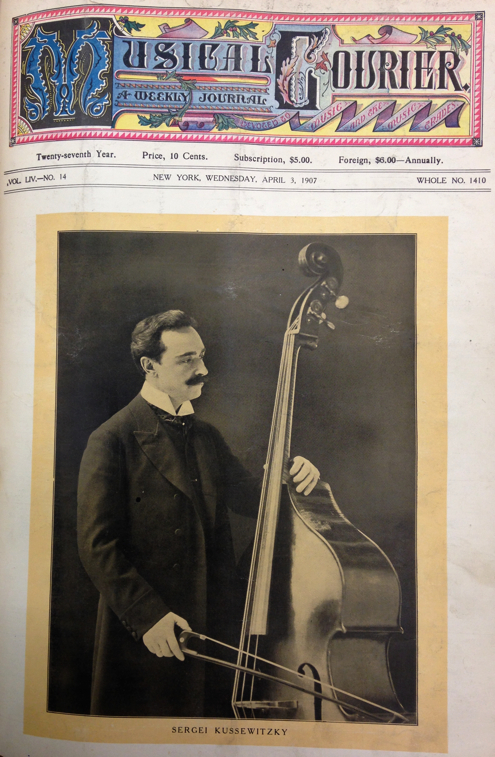 Koussevitzky's final chapter as a performing bassist opened with two solos that he performed when receiving an honorary doctorate at Brown University on Feb. 24, 1926, and continued with three ground-breaking recitals in Boston (Oct. 24, 1927; Oct. 17, 1928; and Oct. 22, 1929).12 During this same period he made the first recordings of double bass solos.13 Never again would he play the bass in public. These facts are, for the most part, well-known. What, however, did he play? What was Koussevitzky's bass repertoire? A thorough, orderly answer contains several surprises, especially pieces composed for, but never performed by, the master of his era. This detailed examination will allow broader reflections.